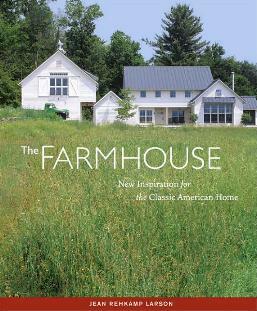 This lovely and inspiring book features twenty new and remodeled farmhouses over the last five years. Farmhouses symbolize peace and tranquility on the land, and for me, evoke great memories even though I've never lived on a farm. Author and architect Jean Rehkamp Larson takes intimate looks at many homes and uses her professionalism to explain many things we take for granted about farmhouses (and homes). The book is beautifully illustrated and made me long for the country. Some of the photos that caught my eye were: pages 10/11 (so much light and you can enjoy the outdoors); page 30 (love the kitchen), and page 73 (exquisite library). Often the surroundings add to the home's beauty. Gone are the dark old-fashioned prairie homes, and in their places are modern, airy, and roomy homes, depending of course, where in the country the homes are. Farmhouses featured are in New York, Massachusetts, Wisconsin, Maryland, California, and Wyoming among other places. The ideas you can get here can be incorporated into your own home design - there are lots of examples - look into the pictures for detailed ideas. Conclusion - Very interesting and beautifully catalogued.